❥ Smooth surface won't cutting your hands. ❥ Stainless steel worktop for optimum strength and durability. ❥ Simple and practical design, classical and exquisite appearance. ❥ It is durable, easy-to-clean and corrosion-resistant for food preparations. ❥ Come with a lower shelf, all the ingredients and utensils can be kept properly and safely. ❥ Four adjustable bullet feet ensure the table to be level even if the floor is not. ❥ A perfect choice and a kitchen aid in food service areas. ☀【High quality】Stainless steel worktop for optimum strength and durability. It is durable, easy-to-clean and corrosion-resistant for food preparations. ☀【Easy to clean】Simple and practical design, classical and exquisite appearance. Easy cleaning and superior working comfort. ☀【Large capacity】Come with a lower shelf, offering more storage space, all the ingredients and utensils can be kept properly and safely. 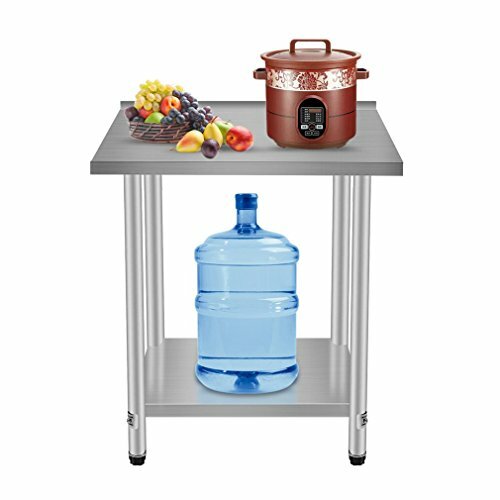 Size: 76 x 60 x 90cm/30" x 24" x 35.5"
☀【Perfect choice】Our stainless steel work table is the perfect prep table for use in any kitchen, bar, restaurant, laundry, janitorial room, cafeteria, garage, home, or other commercial setting.